The fishing in the park has slowed down just a bit although you can still catch plenty of fish. The water is getting extremely low and after last year we are all a bit worried to say the least. If we don’t start getting rain really soon, this summer could actually be worse than last summer. The fish are still hungry so the fishing is at least decent. 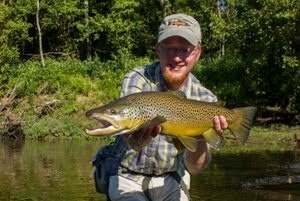 This past weekend I headed up high above Elkmont to Fish Camp Prong and did very well. The water is still plenty cool up high and the fish are relatively stupid. The downside is the long hike to get there and also the fact that the fish aren’t quite as large as their relatives downstream. Last night I fished above Elkmont and did alright. 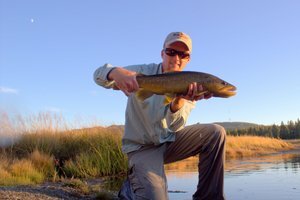 The fish are starting to get used to seeing all the yellow stonefly imitations out there so don’t be afraid to simplify the game. A small light colored parachute in about a #14-#16 will often catch fish when a stonefly dry will only draw mild interest. I’ve been having good success with a light cahill parachute I tie but anything similar should catch a few. Also don’t forget the terrestrials. Yesterday a customer came into Little River Outfitters and while chatting about he fishing, he told me that he hadn’t been able to catch many fish in the morning but finally tied on a green weenie and started doing well. Ants and beetles will work as well and are often overlooked by many anglers. 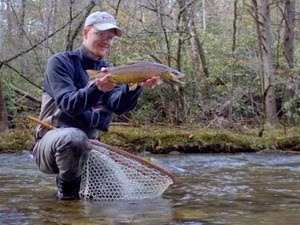 The large golden stoneflies are showing up in the Elkmont vicinity on Little River now and fishing a nymph imitation might get a large brown to eat. The biggest key to having success right now is to be very sneaky. 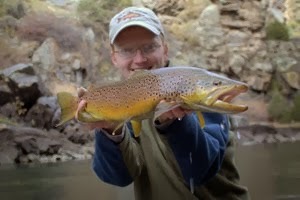 Despite catching good numbers of fish lately, I’m still spooking a lot of trout. 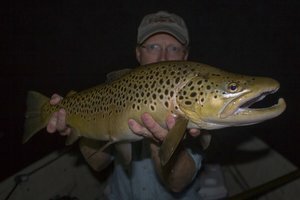 Be sure and hit all the small pockets close by the better pools because there will often be fish from the pool feeding up in the faster water. I think things will start to get a bit better next week. It has been relatively dry down here this month, too, but lately the storms have started to fire up every afternoon. Hopefully, the Atlantic ridge will break down a bit, and some of that Gulf moisture will work its way up to the mountains. We'll be up there next week.